Have You Played Backpacker Bingo Yet? Every notice how you see some of the same kinds of people and sites when you’re backpacking around the world? Ever wish you had a handy printable Bingo card to make a game of seeing those things? Well, you’re in luck. 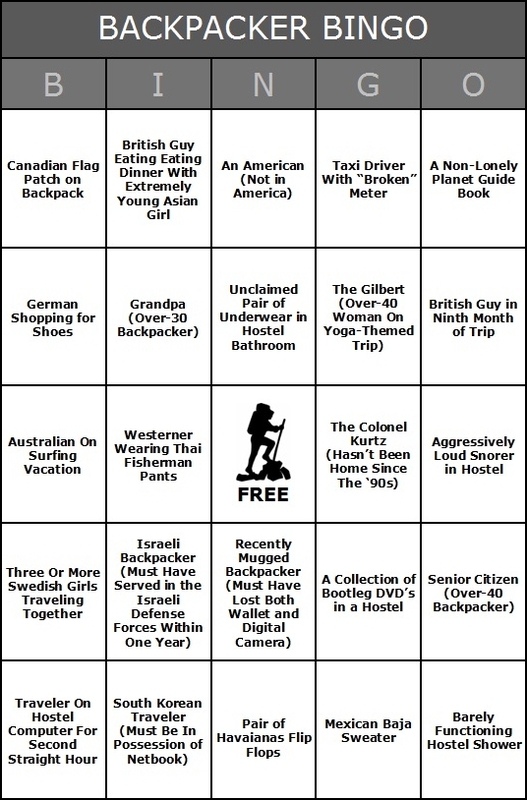 As featured in our book, The Expeditioner’s Guide to the World, Backpacker Bingo will undoubtedly provide you with hours of fun on the road, and may even spark a few international incidents! Click on the above Backpacker Bingo card, print it out, pass it around your broke-down minibus, hang it up in your hostel kitchen, give out to your new Israeli best friends, then sit back and let the fun begin. Buy The Expeditioner’s Guide to the World today on Amazon (available in paperback and e-book).